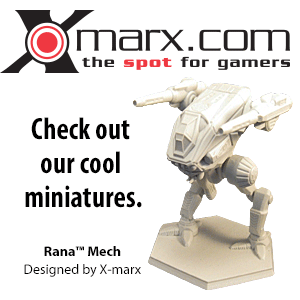 This article is about the Black Knight BattleMech. For the computer game, see MechWarrior IV#MechWarrior IV: Black Knight Expansion Pack and MechWarrior IV: Black Knight. The Black Knight was introduced in 2578 both as a front-line combatant and as a command BattleMech at the company and battalion level for the Star League Defense Force. Its advanced communications gear allowed the Black Knight to effortlessly coordinate an entire company of 'Mechs simultaneously, could easily link together the command frequencies of an entire parent regiment and connect with orbital support satellites. Advanced building materials gave the Black Knight a light but strong chassis able to carry more weapons and armor for less weight. Given the type and amount of firepower the 'Mech carries the only issue facing the Black Knight is heat management. The Black Knight first debuted in the Reunification War when they were fielded by the 3rd Heavy Assault Regiment in combat with the Taurian Concordat; following its success it was soon adopted by I Corps and the rest of the SLDF. When the Star League collapsed, Kong Interstellar continued producing Black Knights until their Connaught orbital factory was destroyed in 2802. In 2809, Kong was able to restart their production line, but was no longer capable of producing many of the more advanced components found in the Black Knight. As a result, Kong was forced to design a downgraded version, the BL-7-KNT. Finally the Black Knight production line was permanently destroyed in a raid by the Capellan Confederation in 2820, reducing the company to producing low-grade spare parts and performing maintenance. During the Succession Wars many Black Knights fell into the hands of the Great Houses, although as the years progressed they were increasingly forced to repair them with inferior components and their numbers slowly decreased. Some were modified with a number of non-standard components such as jump jets but few if any survived into the Thirty-first century. ComStar's stockpiles of Star League 'Mechs included the Black Knight, which they found to be an excellent command unit for Level II and Level III units when the Com Guards were formed, but the very few Black Knights gifted to the Draconis Combine during Operation Rosebud was apparently the result of a clerical error. For their part the Clans maintained the Black Knight, although by the time of the Clan Invasion it was reserved for solahma units. The Black Knight was one of several Clanbusters put together by ComStar leading up to the Battle of Tukayyid, and in the 3063 Robinson Standard BattleWorks secured a license from Kong Interstellar to build a new variant, the BL-12-KNT. Two years later KIC finished rebuilding their plant and began producing Black Knights of their own. The Black Knight is an all energy weapon 'Mech, with a Magna Hellstar II PPC in the right arm serving as its primary weapon. Backing up the PPC are two McCorkel Large Lasers in either side torso that can inflict a great deal of damage as the Black Knight closes with its enemy. Finally, for close range fighting, the 'Mech employs four Maxell DT Medium Lasers, one in either arm and in either side torso and a single Magna Small Laser in the head. The small laser in particular is directly tied-in to the Beagle Active Probe mounted in the center torso, allowing the scanner to piggy-back a low-power laser pulse to travel through any interfering objects. While allowing for a more detailed analysis of objects the limited range of the laser reserves this type of scanning only for nearby targets. Thirteen tons of armor protection on an Endo Steel frame also allows the Black Knight to stand up to a great deal of punishment. The main drawback of the design is its use of single heat sinks, though the fact it mounts twenty of them means the Black Knight is still able to dissipate a great deal of the heat produced by its weapons. 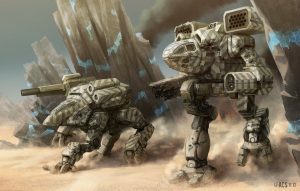 However, if the 'Mech finds itself in a protracted combat situation, a less experienced MechWarrior unskilled at heat management can find themselves in trouble. BL-X-KNT Black Knight "Red Reaper"
This variant is based on Ian McKinnon's Black Knight. The only difference is the Hatchet being replaced by an Autocannon/20. Elizabeth Hazen - SLDF Major and eventually founding Khan of Clan Jade Falcon, Elizabeth Hazen was known to pilot a Black Knight throughout her career. Dana Kufahl - founding Khan of Clan Coyote, was known to pilot a Black Knight throughout Operation KLONDIKE. Ethan Moreau - The first Loremaster of Clan Goliath Scorpion, Ethan Moreau piloted a Black Knight until his death against Clan Fire Mandrill's Kindraa Mattila-Carroll. Ian McKinnon - AFFS Mechwarrior and Commander Ian McKinnon piloted a Black Knight during his tenure with the Fox's Teeth unit. Michael Lawhorn - Black Knight Legion Colonel, Michael Lawhorn piloted the namesake mercenary mech until his death from the Lyran Alliance's betrayal. His mech would later be recovered and used by his successor, Eric McClair. ↑ Technical Readout: 3039, p. 270, "BL-7-KNT Black Knight"
↑ BattleMech Manual, p. 90 Design Quirk Table - Black Knight Entry. This page was last edited on 7 April 2019, at 14:49.